"Here are The Courettes " - The first sign of life from The Courettes struck like a bomb in 2014. The first edition was sold out within a month and had to be reprinted three times, so far. Their music led the brazilian-danish duo to tour throughout Europe. Invitations to all major Sixtiespunk festivals followed. The numerous shows prove the obvious - the two are made for the stage. Naming two of their legendary shows: for once their real loud and illegal balcony show during Reeperbahn Festival (including a roadblock by the police) or on the other hand - their performance less than 24 hours after their son Lennon was born. You just cannot deny, The Courettes are a born live band. Even greater, that they have taken their time recording the second album "We are the Courettes". Together with producer Kim Kix (known for his band Powersolo) they have thrown such a big bang into the pit that you have no choice but to get your Chelsea boots out of the closet and swing your legs in style. The Courettes have redefined their musical spectrum with some sixties Girl Pop and Soul, without losing their typical dirty fuzz sound. 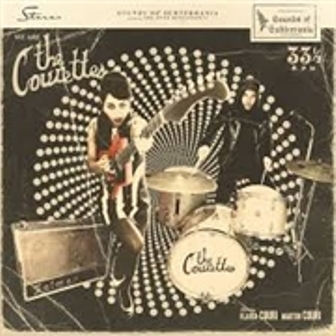 "We are the Courettes" wades so deep in the sixties sound, that even the Brazilian horror movie legend Coffin Joe cast a few spells for this album. As if that is not enough, on 17.03. with "Voodoo Doll", the first single from the album, will be a real sensation, rather a revolution. More on that later, so keep your eyes open.